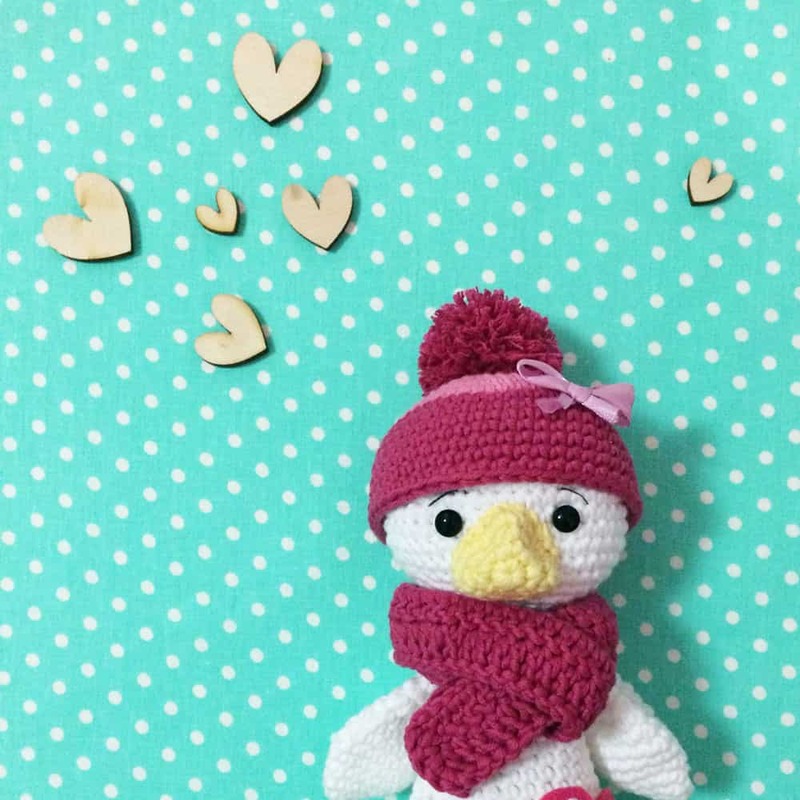 Meet Nixy the little curious Phoenix and her friends! 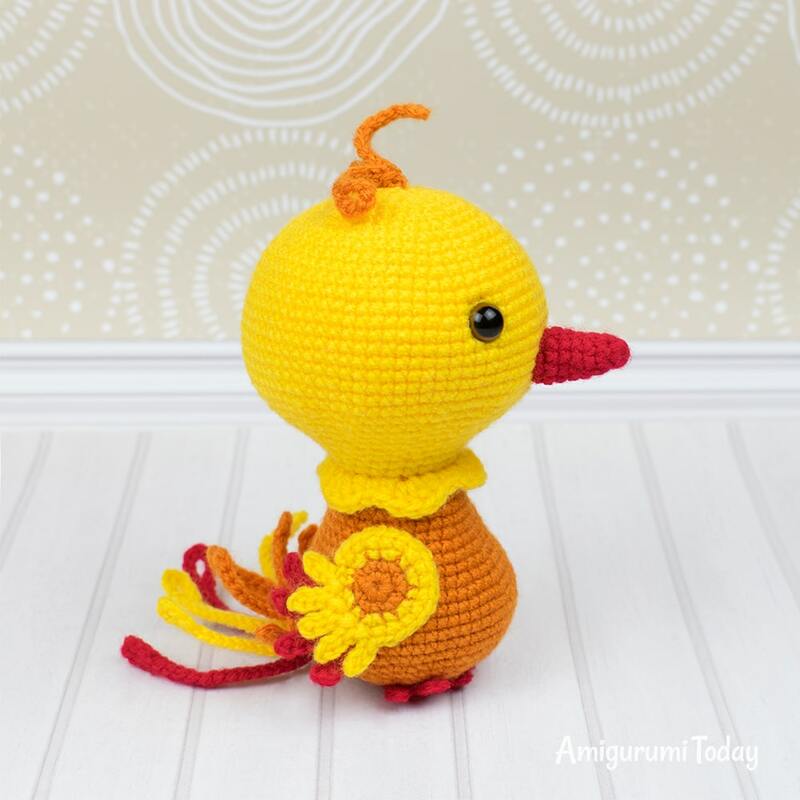 Get our phoenix amigurumi pattern to make an unforgettable gift for avid fantasy lovers and unique toy collectors. 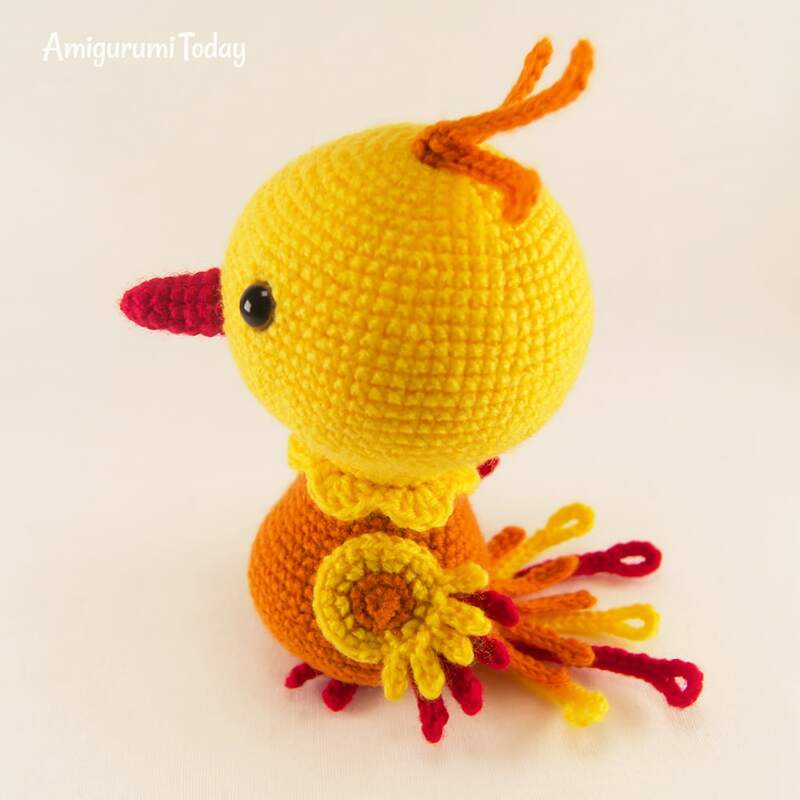 The finished amigurumi phoenix is about 13 cm (5.1″) tall. 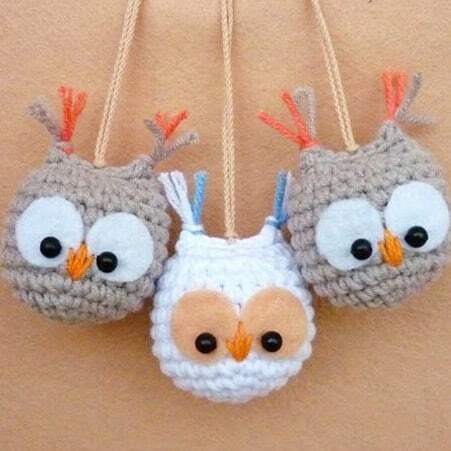 Please pay attention that the size of your crochet bird depends on yarn weight and hook size. 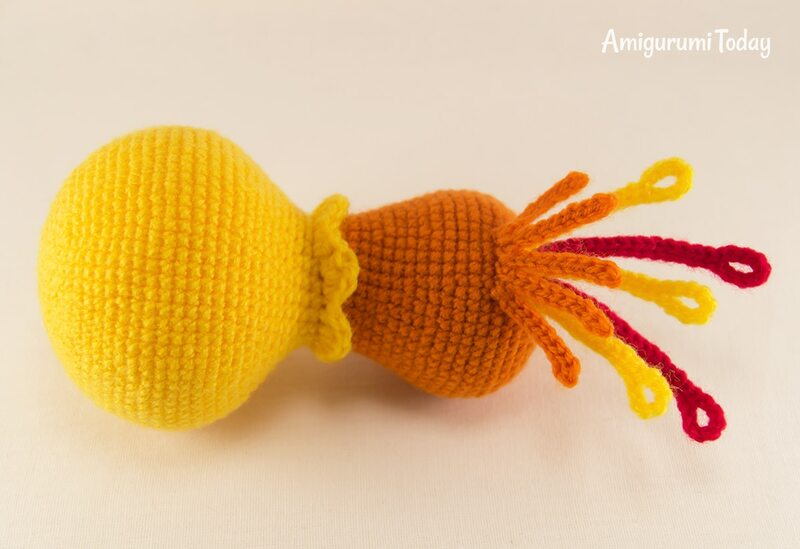 If you use thicker yarn, your toy will be bigger. Insert safety eyes between Rnd 15 and Rnd 16, at the distance of 14 st in between them. Stuff the head with fiberfill. 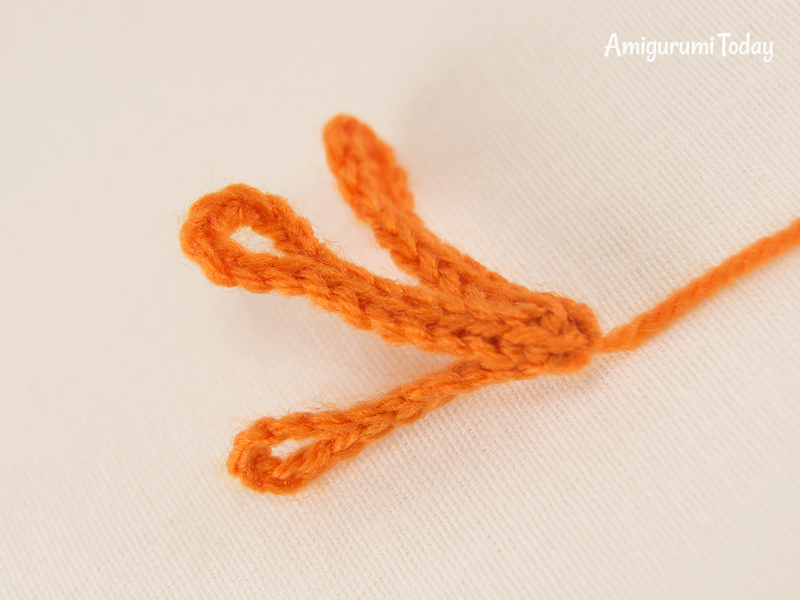 Change to orange yarn, joining the yarn to the back loop. Stuff the body with fiberfill. 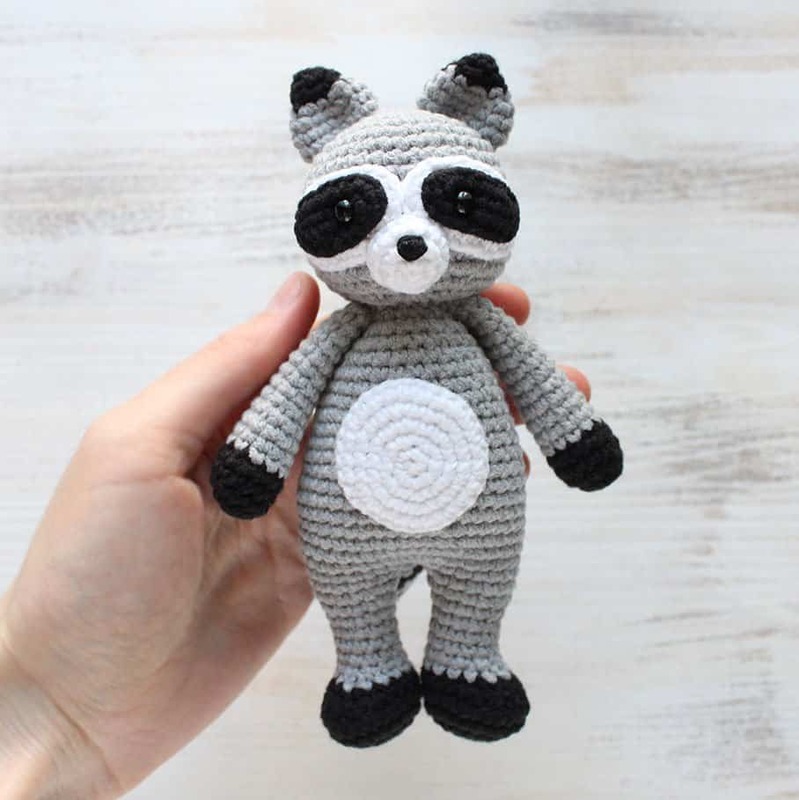 Fasten off the yarn, leaving a small tail. 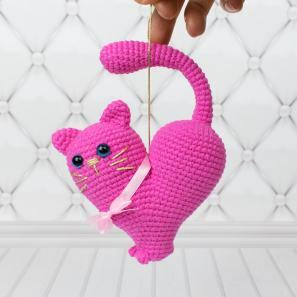 Pass the yarn end through the front loops of the rest 6 stitches with your hook or sewing needle and pull to close the hole. Weave in the end. 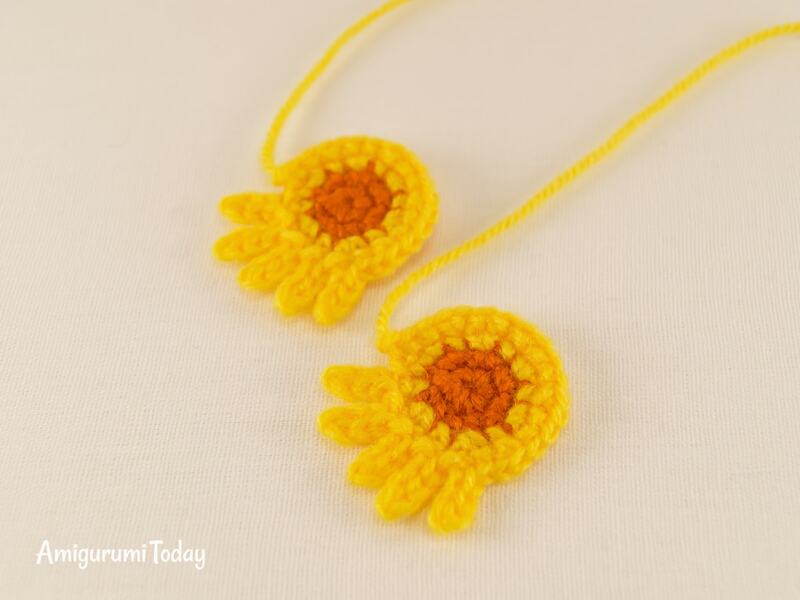 Join yellow yarn to a front loop of Rnd 31. Rnd 1: 2 ch, dc in the same st, hdc in next st, sc in next st, (hdc in next st, 3 dc in next st, hdc in next st, sc in next st,) repeat 5 times, hdc in next st, dc in the beginning of the round, join with sl st.
Fasten off and hide the tail. Finish with sl st. Fasten off leaving a tail for sewing. Rnd 4: (sl st in next st, 4 ch, sl st in next 3 ch beginning from 2nd ch from hook) repeat 5 times, sc in next st, (inc, sc in next 2 st) repeat 4 times, sl st.
Fasten off leaving a tail for sewing. (7 ch, sl st in next 6 ch beginning from 2nd ch from hook) repeat 4 times. (15 ch, beginning from 8th ch from hook – sl st in next 8 ch) repeat 3 times. Fold in half and fix the edges with sl st. Fasten off leaving a tail for sewing. Rnd 2: 4 ch, sl st in next 3 ch beginning from 2nd ch from hook, sl st in next st, 5 ch, sl st in next 4 ch beginning from 2nd ch from hook, sl st in next st, 4 ch, sl st in next 3 ch beginning from 2nd ch from hook, sl st in next st.
(25 ch, beginning from 8th ch from hook – sl st in next 18 ch) repeat 2 times. (20 ch, beginning from 8th ch from hook – sl st in next 13 ch) repeat 3 times. (10 ch, beginning from 2nd ch from hook – sl st in next 9 ch) repeat 5 times. 1. 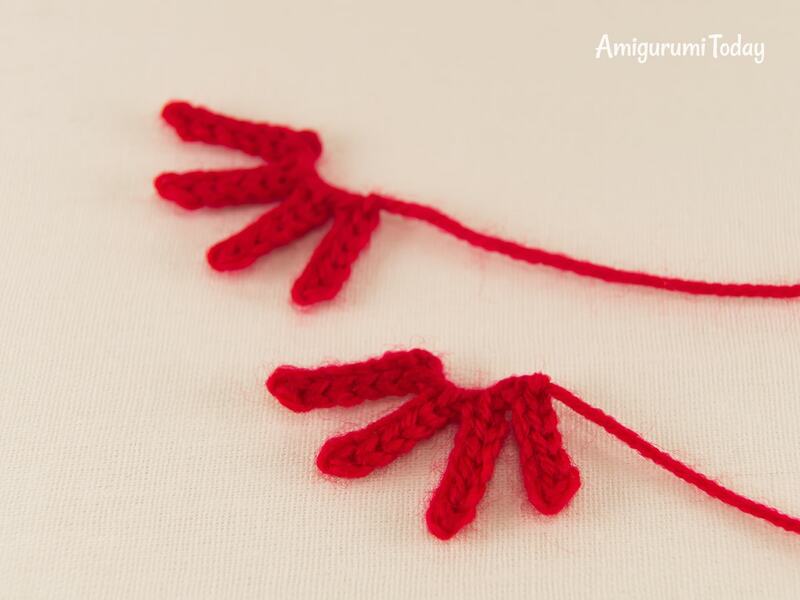 Sew the red tail feathers on Rnd 49 of the body at the back. 2. 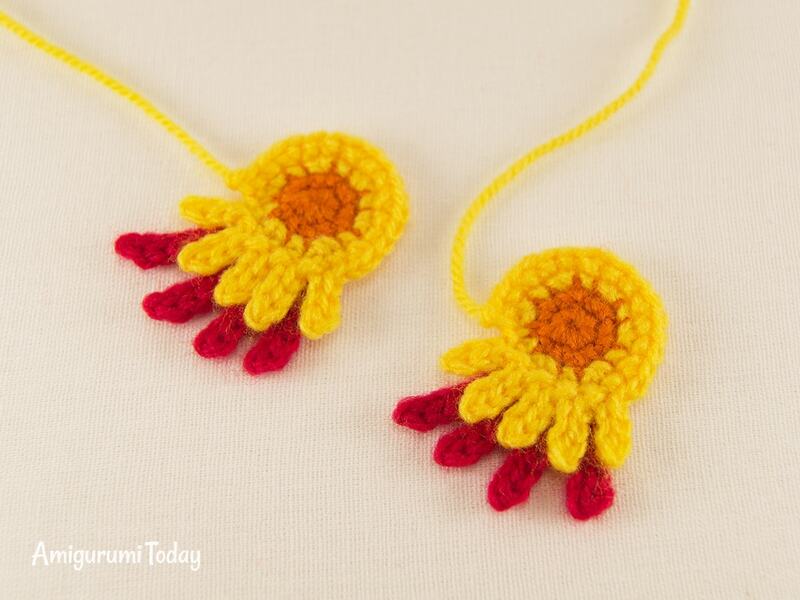 Sew on the yellow tail feathers one round above the red ones. 3. 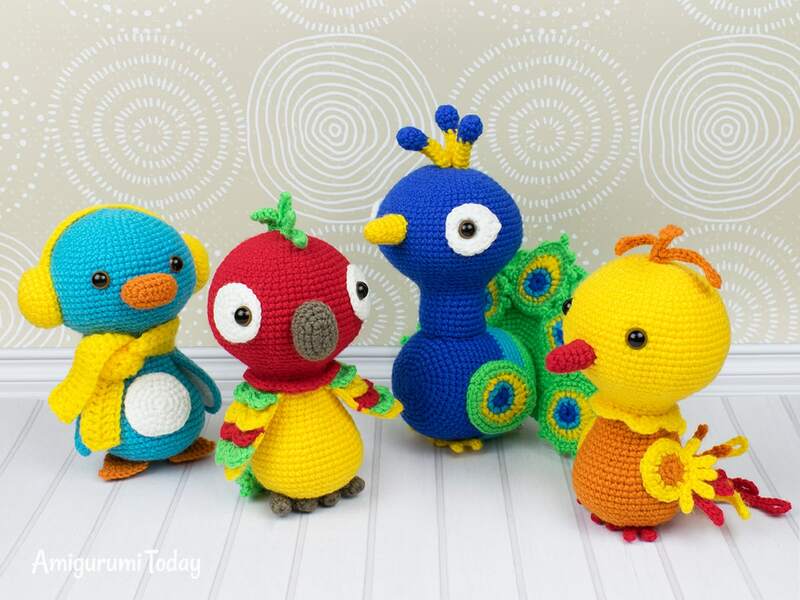 Sew on the orange tail feathers one round above the yellow ones. 4. Sew on the wing feathers from the wrong side. 5. Sew the wings on the sides between Rnd 34 and Rnd 45. 6. Stuff the beak with fiberfill and sew it to the head between Rnd 18 and Rnd 22. 7. 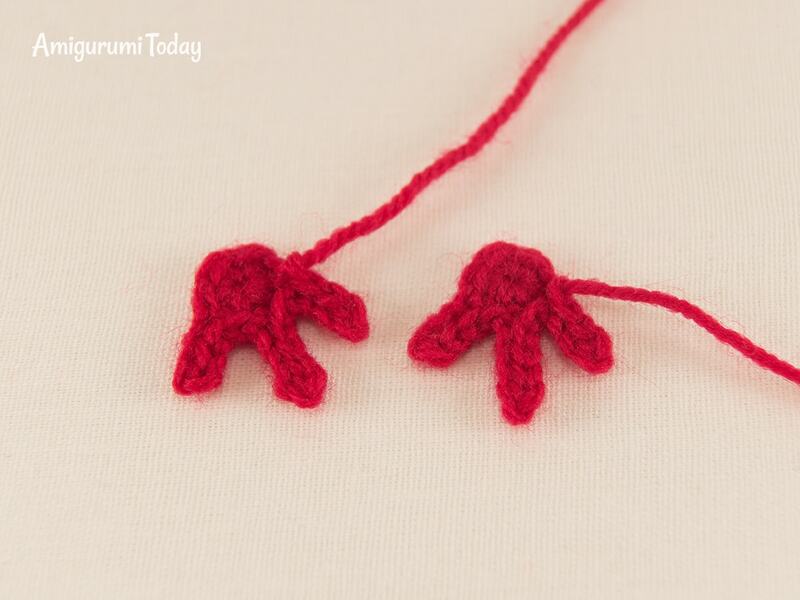 Sew on the feet so that your crochet bird could stand on its own. 8. Sew the crest on the top of the head. Congrats! 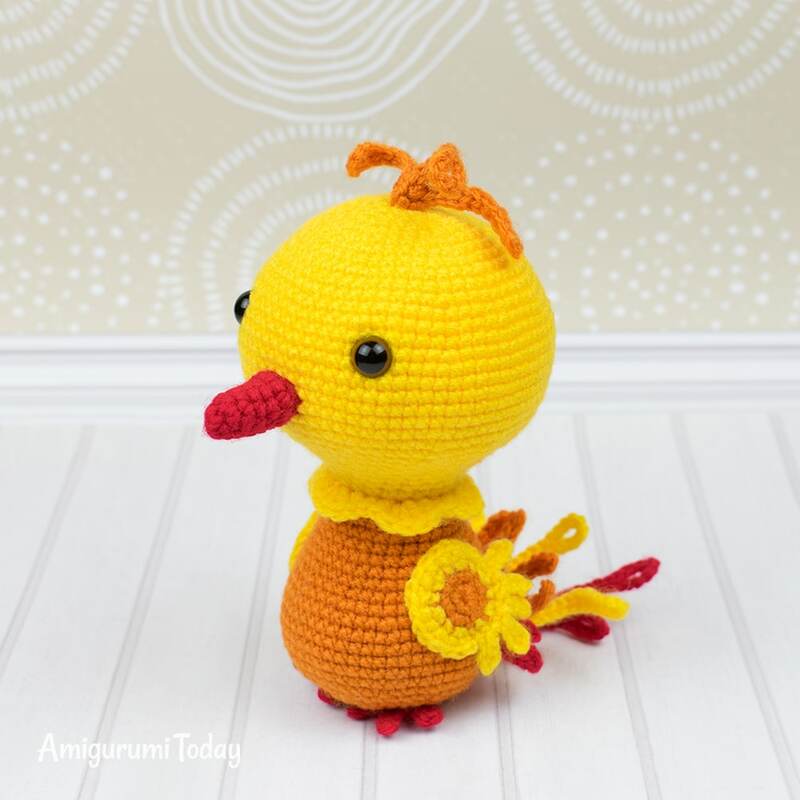 Your amigurumi phoenix is done! How to print this page? 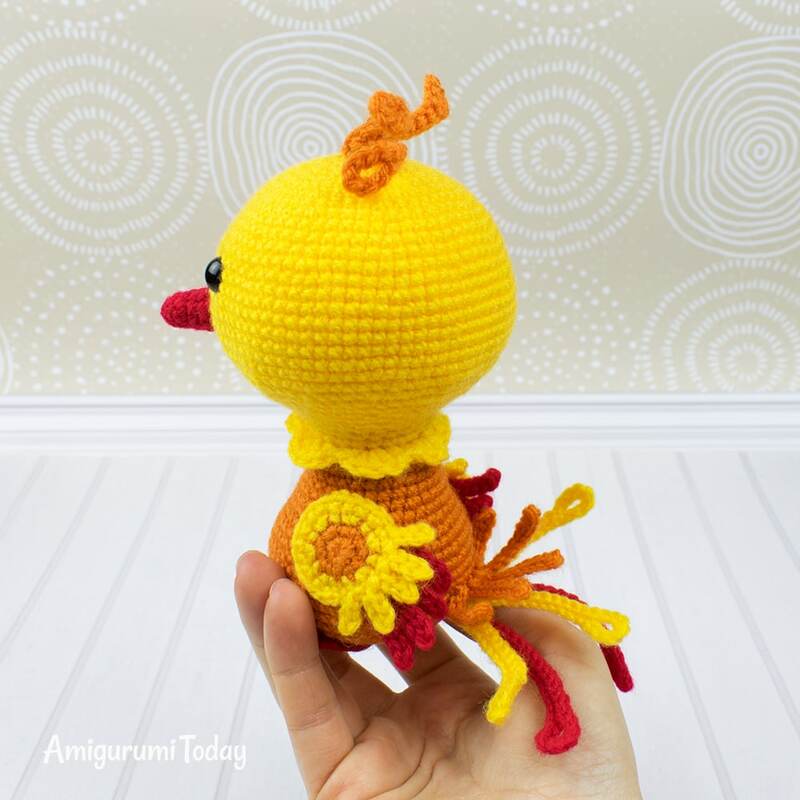 © 2016-2018 by Amigurumi Today. All rights reserved. 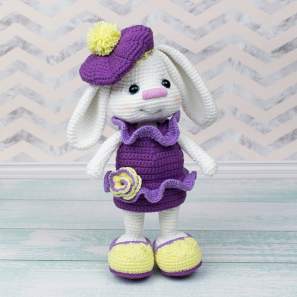 The pattern/article (or parts of it) may not be reproduced, distributed or resold, translated, published, altered, shared or posted (for sell or free) over the Internet or offline. 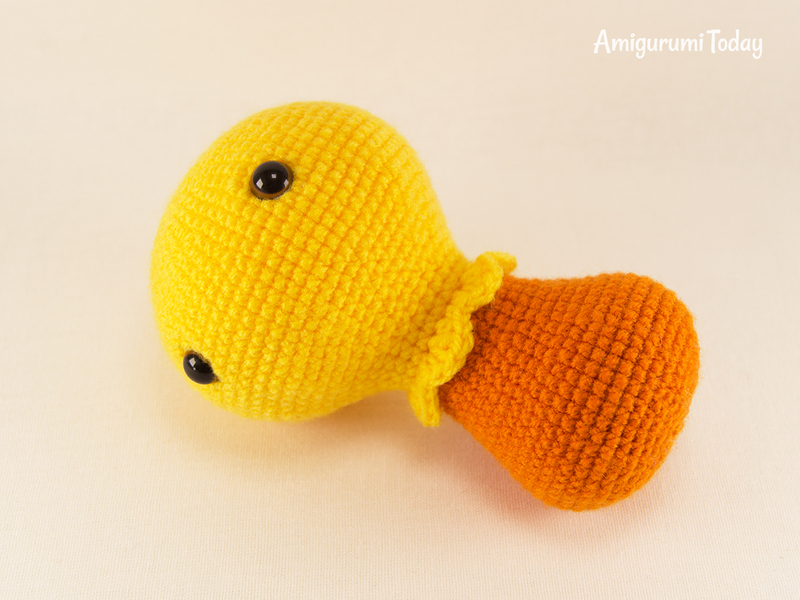 You can sell finished items made from this pattern, but mention that the item is made using the pattern from Amigurumi Today is necessary. 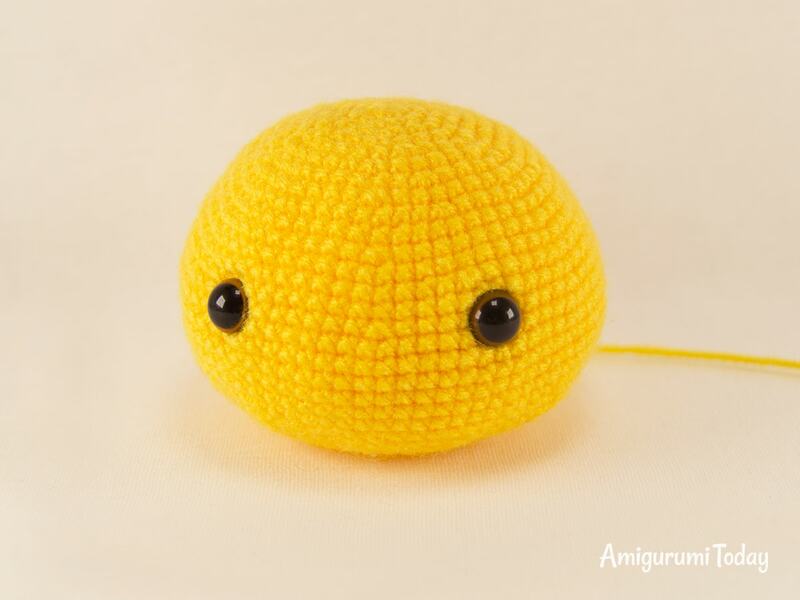 Amigurumi Today Copyright © 2016 - 2019.